We were honored to presented by the North Carolina Dance Festival in Asheville, NC this past weekend! We performed at the charming Be Be Theatre which keenly reminded us of some of our favorite theatres in NYC!The BeBe Theater is a cozy and intimate black-box theater along a back street in downtown Asheville. The theatre is run by two local creatives: Susan and Giles Collard. We were warmly welcomed, celebrated and were honored to sell out our last show. 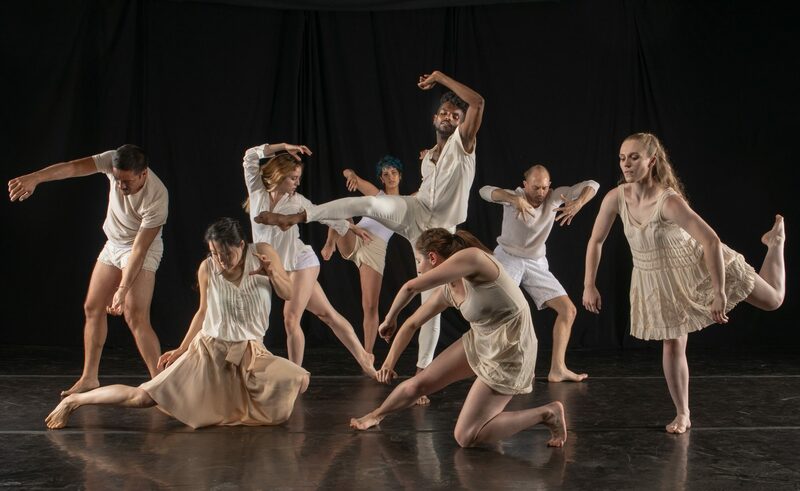 The shared evening also featured Megan Mazarick, Ashley McCullough, Kristen Taylor Duncan and local group Asheville Contemporary Dance Theatre. We were excited to present “Dead Man’s Walk,” the touring version of our recent evening-length “I Promise,” and a response to MLK Jr.’s iconic “I Have a Dream” speech. It may have been our strongest performance yet. During the artist Q & A following the performance, we received numerous heartfelt responses to our work. Our work was met with more “thank you’s” than questions, more observations and responses than inquires. It was a beautiful sentiment to knowing that we reached our audience on this tour. We sure hope to be back again soon and left feeling humbled and grateful for the opportunity! Huge thanks to Anne Morris at NC Dance Project for her passion to cultivate our NC Dance community and all of the opportunities it provides for us as artists! As well as thanks to Susan and Giles Collard for being incredible hosts for our work! Here is Anne in early morning action on our behalf! For sure the culprit to selling out our last show! I was honored to be invited to offer a free community master class on Saturday morning at the BeBe Theater. I was excited to share Shaga, the company’s movement language and how we used it to create the opening sequence of “Dead Man’s Walk.” We were met with such an enthusiastic response, I believe several of the students will soon be heading to Durham to join one of our upcoming community classes! Huge thanks to this willing and eager group of movers! We had a wonderful time sharing and moving with all of you! In this 2 hour workshop we begin with an hour Shaga class, as we learn to approach movement as a dynamic, healing, and ever-changing power, using evocative ideas and imagery in a safe, non-judgmental environment. Class begins slowly and builds in intensity to continuous motion, providing enjoyable exercise for both body and soul. The second half of the class offers a deep exploration of the movement language with sequences that allow us to actively explore our habits, expand our range and discover the endless possibilities of healing ways of moving in a welcoming, accepting atmosphere. This workshop is for individuals who wish to open themselves to movement in new ways. Dancers, yogis, and movers of all kinds and abilities are invited to participate. No prior experience necessary. Global Breath Studio is located in downtown Durham and was built to embody the understanding that we are all part of the same global family, where we share our resources, and our compassion for all beings. Every practice at Global Breath supports LiveGlobally, a Durham-based 501c3 non-profit, committed to creating and supporting sustainable programs for the wellbeing of individuals and communities, locally and globally. ShaLeigh Dance Works was honored to have been scouted for RAW: natural born artists. The one night event featured 50+ hand-selected emerging artists across fashion, music, visual art, photography, performing art, hair, makeup and accessory design, for a one night creative explosion! Guests wandered through pop-up interactive art galleries and experienced incredible live performances and runway shows. We had loads of fun creating a new adaptation of E Pluribus Unum II with a Downton Abbey twist and runway show both inspired by our last company photo shoot with Robin Gallant. We are eager to share this version again and expect a new project brewing on the horizon with Durham’s own DJ Playplay. RAW believes that we are stronger together than we are apart. By joining together we can do more to share the creative culture of our generation. RAW thinks that every independent artist deserves the right to be seen, heard and loved. Head to www.RAWartists.org/Raleigh/CONNECT to see the full lineup of the incredible local artists we joined! Check out Company Member Hannah Marr rocking out at our Workshop! We love this shot taken by Stephanie Leathers. Since 2004, Moogfest has been a forum for the exchange of ideas. By day, Moogfest is a platform for conversation and experimentation, attracting creative and tech enthusiasts for four days of participatory programming in Durham, North Carolina. By night, Moogfest presents cutting-edge performances by early pioneers in electronic music, contemporary pop innovators, and avant-garde experimentalists in venues throughout the city. Moogfest is a tribute to analog synthesizer pioneer Dr. Robert Moog and the profound influence his inventions have had on how we hear the world over the last 60 years. The exchange between engineer and musician that he fostered is celebrated with a unique festival format where the creative process is understood as collaboration among many people, across time and space, in commerce and culture. We just utterly LOVE Dixon Place! ShaLeigh Dance Works performed this past Saturday, April 21st, at the Intersection Stage at Plaza Midwood. We were honored to perform in this year’s Charlotte’s BOOM Festival, an annual artist-led showcase of contemporary and experimental performance and visual art created on the fringes of popular culture. The event was three days long, but the spirit behind it is more than a weekend experience. BOOM is a movement, born from a belief in the explosive power of art to unite and strengthen our community. Their mission is to spark creativity and collaboration among a diverse group of artists, performers and audiences. To deliver on that mission, they have gathered a unique coalition of artists, volunteers, nonprofits, businesses and neighborhood organizations who come together to transform the way art and culture are created and shared in the Queen City. ShaLeigh Dance Works also performed this past Monday, April 23rd at DPAC. We were absolutely honored to perform with Janie Desmond and Micaiah Okonkwo for Reality Ministries’ 2018 Talent Show at DPAC! This extraordinary community event featured performers of ALL abilities and moved us to our core! The talent show is an annual evening that highlights the wonderful talents and unique gifts of our diverse community. Incredible artwork was on display in the lobby and the stage shined with a wonderful variety of numerous performances spanning the full spectrum of performing arts. Reality Ministries creates wonderful opportunities for adults with and without developmental disabilities to experience belonging, kinship and the life-changing Reality of Christ’s love. On Saturday, April 7th, ShaLeigh Dance Works was honored to create a movement installation in the East Building for the Sold Out Opening of North Carolina’s Museum of Art’s You Are Here: Light, Color, and Sound Experiences. The movement installation, entitled “Invocations,” invited community members to move through a score of spatial patterns with light and sound emanating from their cell phones. They activated the entry way with traveling light and sound to stir the senses of the viewers in preparation for this spectacularly immersive art work. SDW Company members were placed throughout the gallery to perform a series of solos, duets and ensemble work created from scores that activated their delicate sensuality through smell, taste, touch, sight and sound. Check out our video above, courtesy of Argyle Rebel Films. The exhibit will continue to run through July 22nd and features immersive art installations by 15 contemporary artists, including large-scale light works, sound installations, video works, mixed-media room-size environments, and site-specific projects. The artists in this exhibition employ a diversity of media to create intriguing experiences that engage the senses, activate the imagination, and provide connections between the viewer and the work of art. This exhibition takes over an entire floor of the NCMA’s temporary exhibition galleries and also transforms the landscape in the Museum Park, creating a campus-wide presentation of contemporary experiential art. Become part of the art. You Are Here: Light, Color, and Sound Experiences, is open through July 22, 2018. Before I received permission to host the March, I had been planning a Dance for Our Lives Flash Mob. Over 50 community members joined together in the cold rain several hours after the March to reactivate the CCB Plaza once again and this time with dance. Witnessing everyone moving together as one created a powerful image of togetherness and interconnectedness. It seemed to enhance the visibility of taking a communal approach to life’s challenges and relating to each other across cultural and ethnic differences. It seemed to also pay tribute to early tribal cultures where dance as ritual was used to grieve, to celebrate and to problem solve together. In essence, it echoed what had happened earlier that day: People coming together as individuals across the spectrum of age and race to share the tears and rage and passion that creates change. Thousands of us found our common ground in the roots of our exposed humanity. And from there, we will March on and we will remember just how important it is to move from grief to action. Thanks to Ryan Pham for the commemorative video of Durham March for Our Lives and to Michael Washington at Argyle Rebel Films for the video of Dance for Our Lives. And a sincere thank you to all of you who came out in support!